This is probably the easiest way to install and run OpenERP on a local machine. This will not go through, as error will show error msg. This is because required libraries are not met. But is ok, linux will remember it, then we can run following command to get them all at once. DONE, Start using it @ http://localhost:8069. For the first use, user will need to create database. 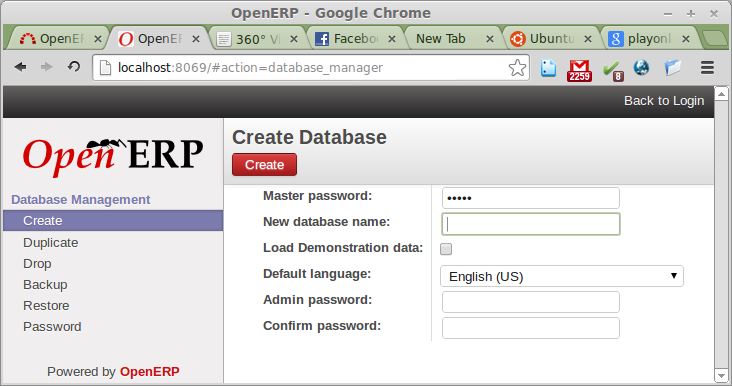 We can now change db_password in openerp-server.conf and restart OpenERP server accordingly.